On Saturday, May 7, 2016, Pedego 101 joined over 1000 bicycle riders for Cruisin’ the Conejo, the Conejo Valley’s largest annual bicycling charity event. We had a fantastic time and would like to express our gratitude to the Conejo Valley Cyclists who hosted the ride, as well as the other participants, and, of course, all the volunteers. Everyone was friendly and welcoming. Our small group of electric bike riders consisted of Pedego 101’s Linda and John, as well as loyal customers Miryam, Sandra, and Warren. Pedego’s model range was well represented by a 24” Step-Thru Interceptor, a 26” Step-Thru Interceptor, a 26” Classic City Commuter, a Ridge Rider, and a Trail Tracker. I wish Paulette had been able to make it on her Stretch! Cruisin’ the Conejo has a variety of beautiful routes from which to choose, ranging from a 10 mile kids cruise to a “Cruisin’ for a Bruisin” double metric (about 125 miles). We opted for the 35 mile ride. It was the perfect choice for our first time, with a mix of familiar and unfamiliar roads and challenging hills through some gorgeous scenery. 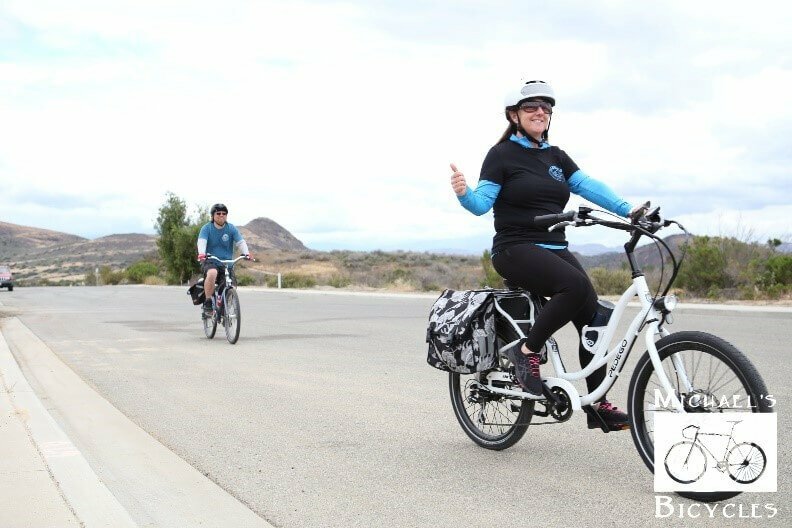 Our route took us right past Pedego 101 in Westlake Village, around Westlake Lake, up and over the hills past Lake Sherwood, down into beautiful Hidden Valley, and through Dos Vientos. It was an extraordinary 2 1/2 hours. How much fun was it? I wish I could adequately describe the joy and excitement on Miryam’s face after the ride. She was ecstatic! She commutes on her Pedego a hundred miles per week, but I believe this was her longest single ride, and she is sooo eager to go even farther. We all seemed to have great fun, no matter what we rode, whether it was a carbon fiber racer, a long tandem, a low recumbent, a stepper bike, or a fat tire e-bike. Oh, the places you’ll go on a Pedego! Check out our ride calendar for upcoming places to take YOUR Pedego.